As I write this, I’m in Switzerland, walking across a chunk of the country, beginning in Engelberg and ending several passes away in Lauterbrunnen. So much of the walk is about mountains, and famed ones at that. Titlis is now behind me, the Wetterhorn has been my near-constant companion, and yesterday came my first view of the mighty Eiger and its north face. Monch and Jungfrau lie ahead. As I savoured my first view of the Eiger yesterday afternoon I was also drawn to one of its adjacent mountains, Schwarzhorn. Only after a few minutes did I realise why my eyes and mind were so taken by this ramped summit – 16 years ago, on my last visit to Switzerland, I’d climbed this mountain. Memory isn’t always my strong suit. But this hike hasn’t all been mountains. 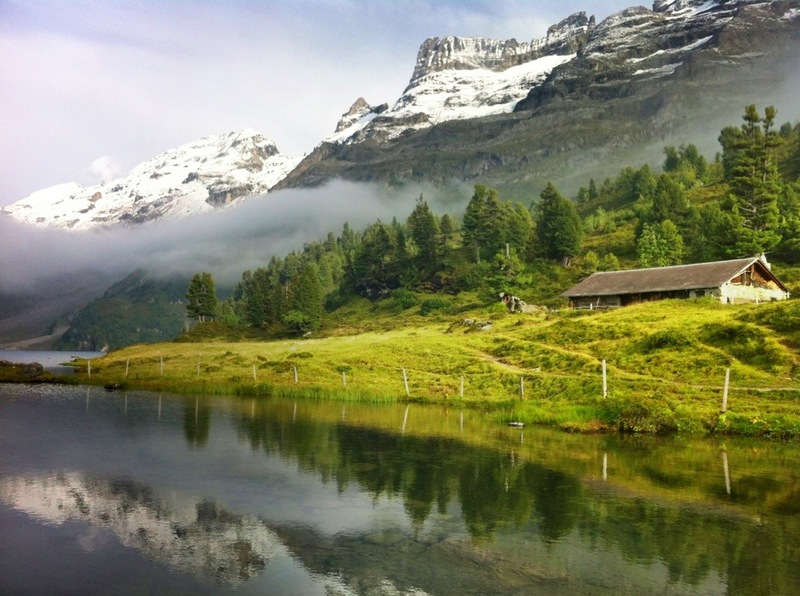 For a time out of Engelberg it was a walk connecting the dots – the high alpine lakes that offer such a gentle contrast to the glaciers and rocky summits. Trubsee led to Engstlensee, which led to Tannensee, each one as still as paintings. This shot is of Engstlensee, just a few minutes’ walk from where I bedded down on the first night of the hike. Titlis rose high above its shores and a shaft of momentary light lit a small peninsula and its farmhouse. Within minutes the mountains, the farmhouse and the lake were swallowed by cloud. I wandered back to my home for the night into a whiteout. * Adventure before Avarice is hiking the self-guided option of the Alpine Pass Route with UTracks. This looks gorgeous! Happy hiking.